Nannies are one of those few people who can make any family’s life easier. These heaven-sent saviors take care of the important, and often, time-consuming tasks of grooming one’s kids, cooking the food, tutoring the children, and even keeping the house clean. In order to hire the perfect nanny who will suit your needs, you must enumerate in your job advertisement the qualifications and prerequisites for your nanny position. 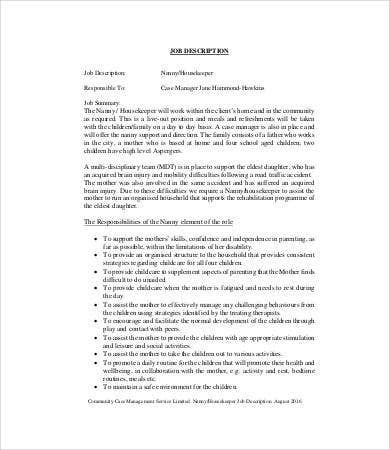 Once you’ve hired a nanny, you need to inform them of their job description. A job description can aid you in making sure that your nanny understands the specific tasks, parameters of their responsibilities, dress code, and other nanny specifics which they need to comply with during the whole duration of their employment. 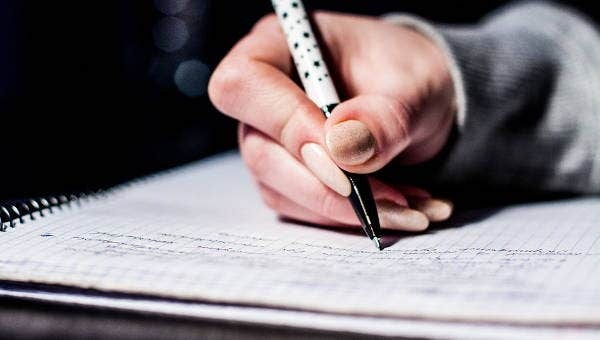 So if you are in need of a childminder, housekeeper, or even a tutor for your child, then worry not for we have collected a variety of job description samples for you to choose from. Just scroll down below and download the ones which suit your needs! Historically, nannies were stapled fixtures in upper-class and nobles households. They were known to be educated childminders who take care of the noble children’s emotional and intellectual development by acting as tutors. Meanwhile, they are also concerned with teaching them proper etiquette and social graces. You may also see Housekeeper Job Descriptions. As mentioned earlier, there are different types of nannies so it is up to you to utilize the appropriate job description which satisfies your present needs. 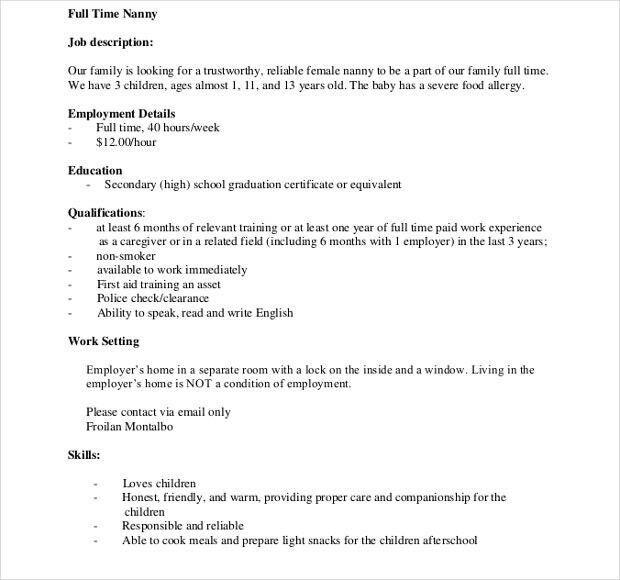 Nanny House Keeper Job Description. This is perfect if you are hiring someone who is supposed to keep your home organized and clean. Cooking, washing clothes, changing sheets, and dusting shelves—this job description will help your housekeeper understand her tasks more clearly. In relation to that, you might also be interested in perusing our Server Job Description templates. Just click on the link provided. 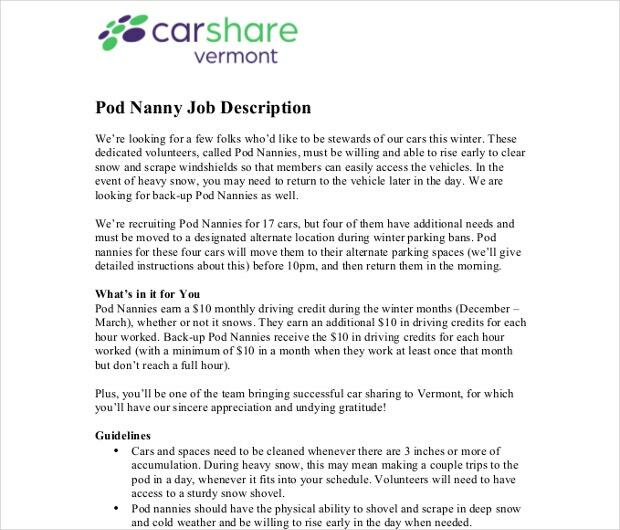 Resort Nanny Job Description. Do you own a resort which you are too busy to administer on a daily basis? 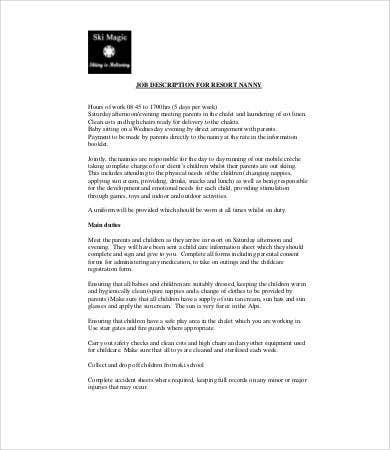 Hire a resort nanny to do the resort-keeping for you and use this job description as your guide. 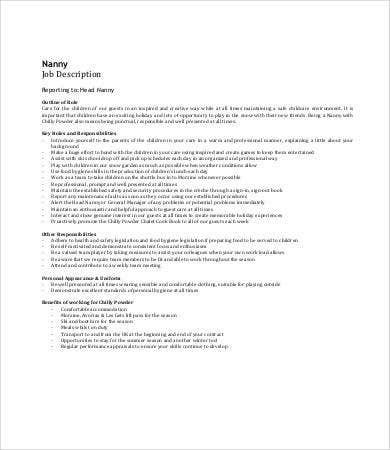 Head Nanny Job Description. If you have a big household with two or more nannies working for you, then it is more time efficient if you assign a head nanny who will serve as the one who manages the rest of your housekeeping and childcaring staff. 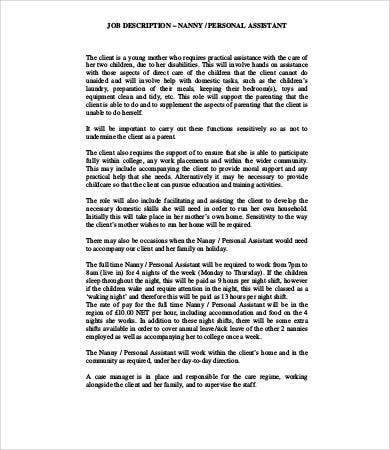 Nanny Tutor Job Description. Are you a busy bee in the corporate world while at the same time a nurturing parent who cares about your children’s educational achievements? 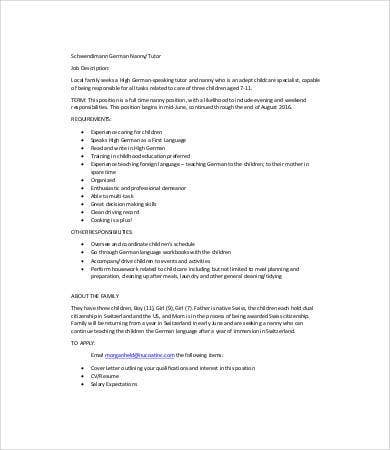 Then hire a tutor for your kids and use this job description as an aid in delineating what you expect from your child’s tutor. 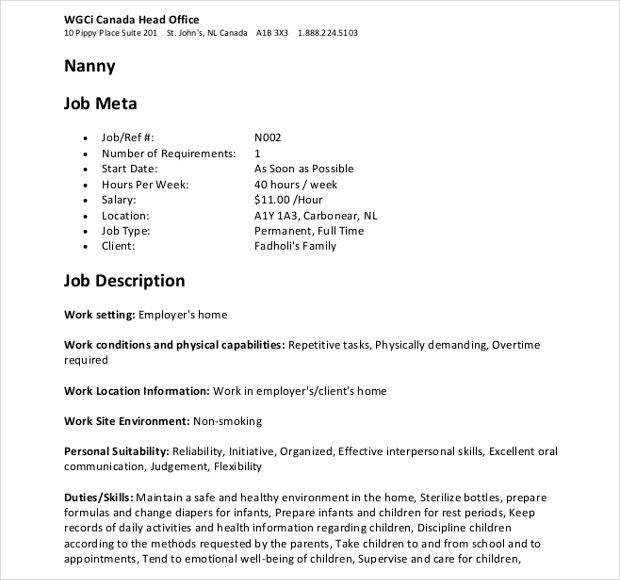 Nanny/Personal Assistant Job Description. 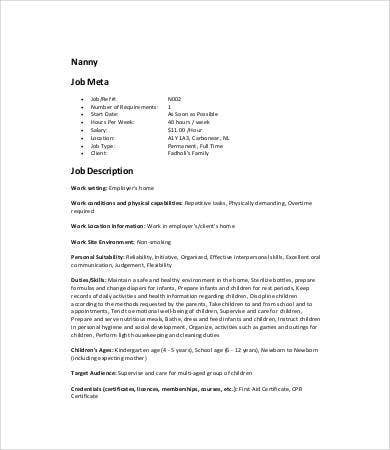 Hiring a PA for the first time must be an act of desperation. So here is a job description template which enumerates for you the basics. Feel free to add more tasks and expectations which you deem necessary for your PA to perform. 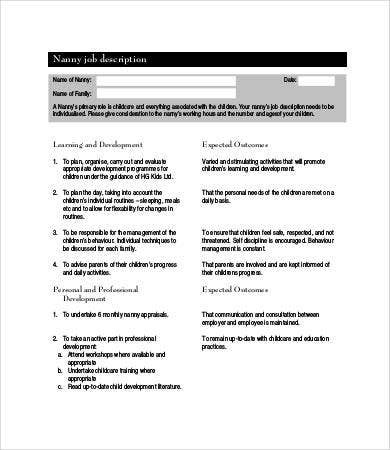 Speaking of hiring, we also offer Social Worker Job Description templates which you can download and edit for free if it serves your purpose.